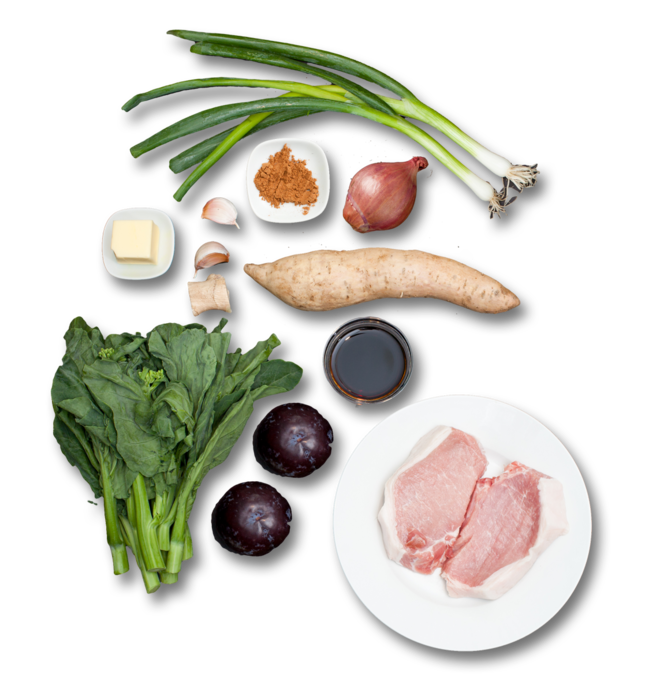 This purple sweet potato, also known as Okinawan sweet potato, isn’t even a member of the potato family—it’s part of the same family as morning glory, or water spinach. The plant is native to the Americas and landed in Japan sometime in the 1500s. It grew so well there that it became popular in many Japanese dishes and now can be found throughout Asia and the Pacific. Heat a medium pot of salted water to boiling on high. Wash and dry the fresh produce. 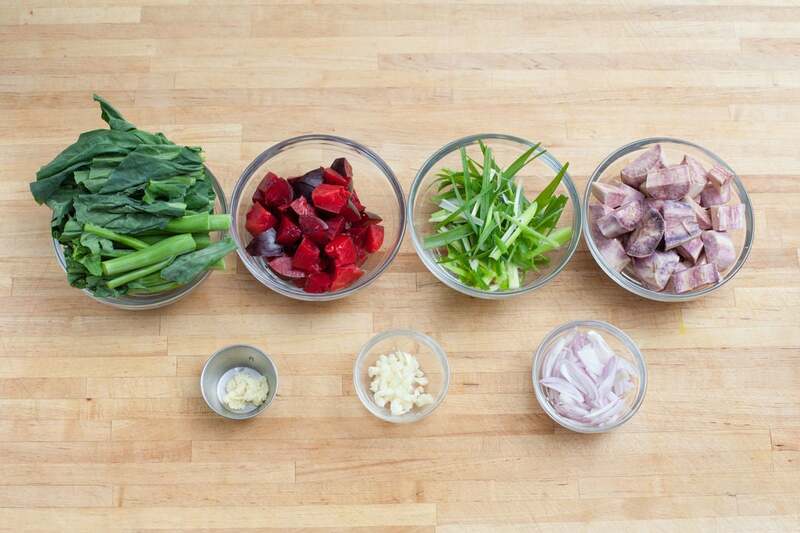 Cut the bunch of Chinese broccoli in half crosswise. Smash and peel the garlic cloves, then roughly chop them. Pit and small dice the plums. Cut the scallions in half crosswise, then thinly slice them lengthwise. Peel and mince the ginger. Peel and cut the sweet potato into bite-sized pieces. Peel and slice the shallot. Add the sweet potato to the pot of boiling water. Cook 11 to 13 minutes, or until tender when pierced with a fork. 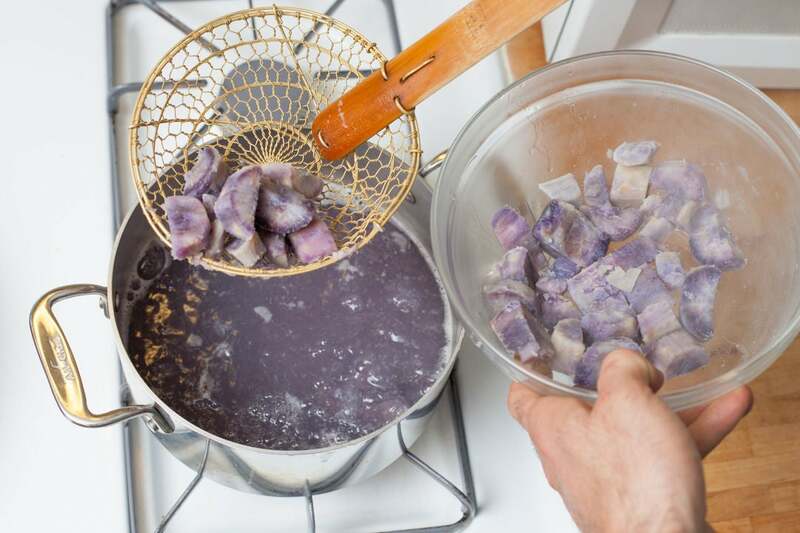 Using a slotted spoon, transfer the sweet potato to a bowl, leaving the boiling water in the pot. 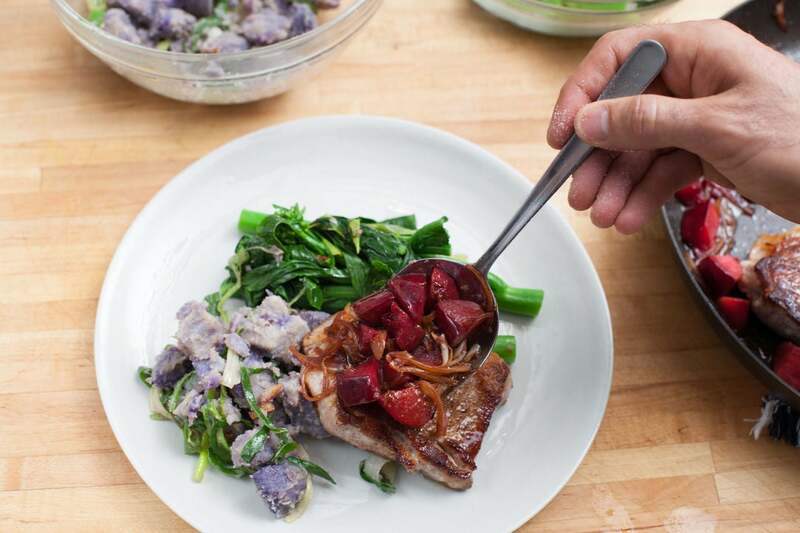 While the sweet potato cooks, pat the pork chops dry with paper towels. Sprinkle the five-spice powder and some salt all over the pork. In a large pan, heat a little olive oil on medium until hot. Add the pork and cook 4 to 5 minutes on the first side, or until browned. 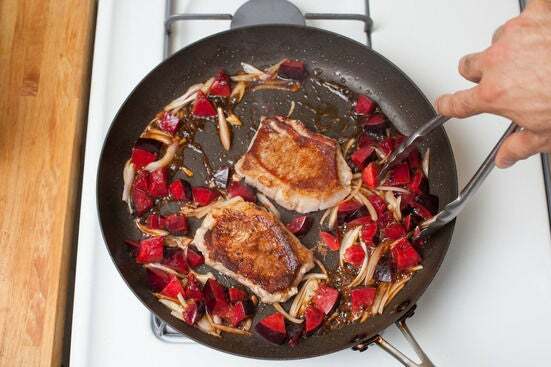 Flip over the pork, then add the shallot, ginger, plums, and soy sauce. 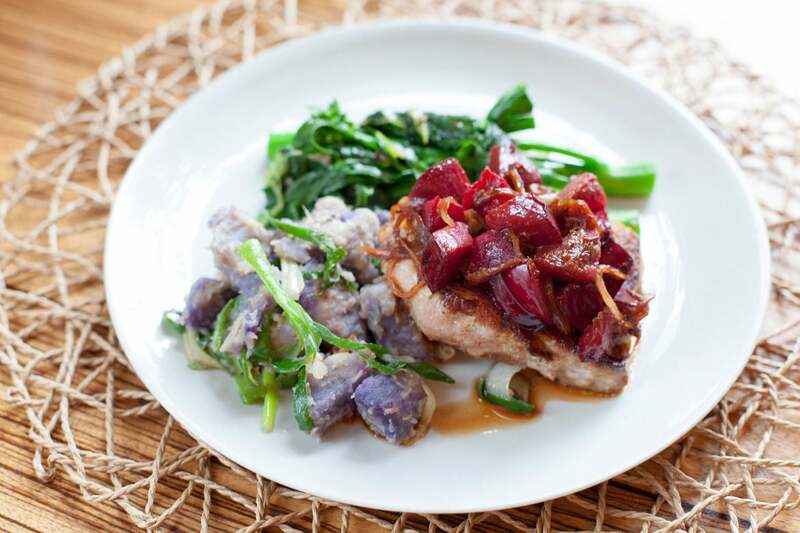 Simmer the sauce for 3 to 4 minutes, or until the plums are softened and the pork is cooked through. Remove from the heat and allow the pork to rest. Add the Chinese broccoli to the boiling water used for the sweet potato. Cook about 2 minutes, or until bright green and tender-crisp. (It’s ok that the water may be a little purple from the sweet potato.) 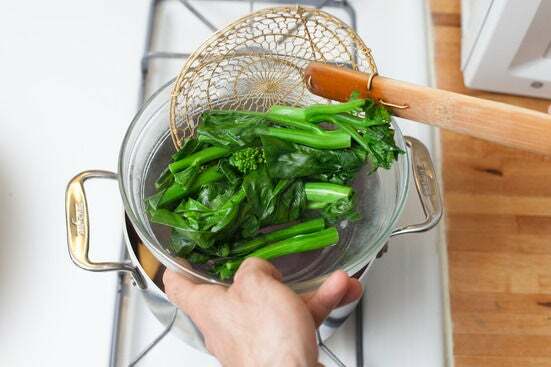 Drain and transfer the cooked Chinese broccoli to a bowl. Wipe out the pot used for the Chinese broccoli. 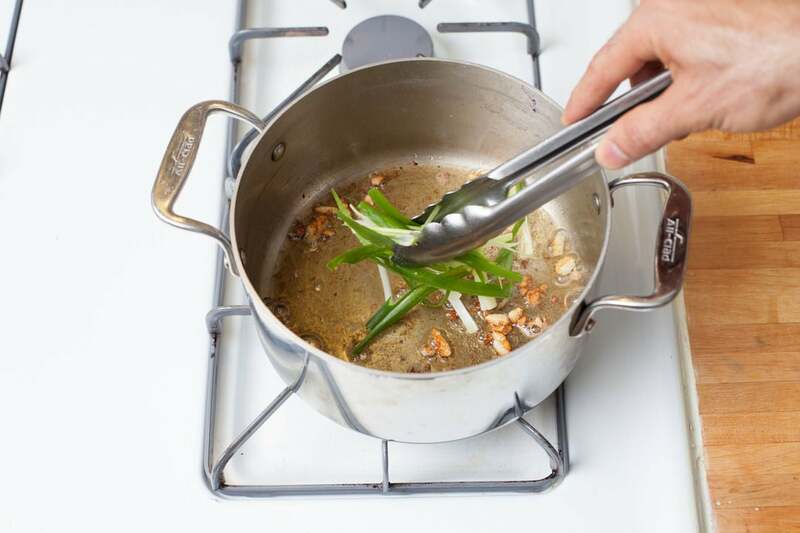 Add the butter and garlic and heat it on medium-high, stirring for about 1 to 2 minutes, or until the butter and garlic both turn golden brown. Stir in the scallions and cook for about 30 seconds, or until fragrant. Divide the garlic-scallion butter between the bowls of sweet potato and Chinese broccoli. Toss each to coat them in the butter and season them both with salt to taste. Place a piece of pork on each of 2 plates. Top each piece with half the plum sauce. Divide the Chinese broccoli and sweet potato between the 2 plates. Enjoy!